The Florida Panthers cut off what could have been a long and dramatic summer of negotiation and landed the most coveted coach on the market just a few days after their disappointing year came to an end. Three-time Stanley Cup winner Joel Quenneville, who was fired early in the season by the Blackhawks, will now buy some shorts and move down to Miami to try and pilot the NHL’s less successful Florida team to their first playoff series win since 1996. Well, first, the Panthers actually have to make the playoffs. After a near-miss last season, the Panthers took a big step back in 2018–19, earning just 86 points to finish 12 out of the last playoff spot, and coach Bob Boughner got the ax for it. But something about this team made them more attractive than other Quenneville options like St. Louis, L.A., Philly, Anaheim, Buffalo, or Edmonton, and it wasn’t just the climate, or what’s surely a big salary, or the presence of ex-Chicago GM Dale Tallon. Forwards Aleksander Barkov and Jonathan Huberdeau are just now entering their prime and tallied career-best, 30-goal/90-point seasons this year, while the team sports other promising youngsters like Frank Vatrano, who scored 24 in his first full season, or Vincent Trocheck, whose season got mangled by an early ankle injury but picked up 30 goals in 2017–18. Defense is a weaker spot, but Aaron Ekblad, at just 23 years old, is already positioned to be their long-term rock on the blue line. Where Quenneville and the big ice cats are going to need help, however, is at goaltender, where Roberto Luongo is unfortunately signed for the next three seasons despite being 40 years old and very clearly on the decline. His younger partner, James Reimer, is signed for two more seasons but didn’t show a spark as a potential solution this year. The Panthers are either going to need to find a goalie in free agency this offseason (Sergei Bobrovsky), commit more money to that position, and hope he does well, or simply wait for the development of prospect Sam Montembeault, who debuted this year. 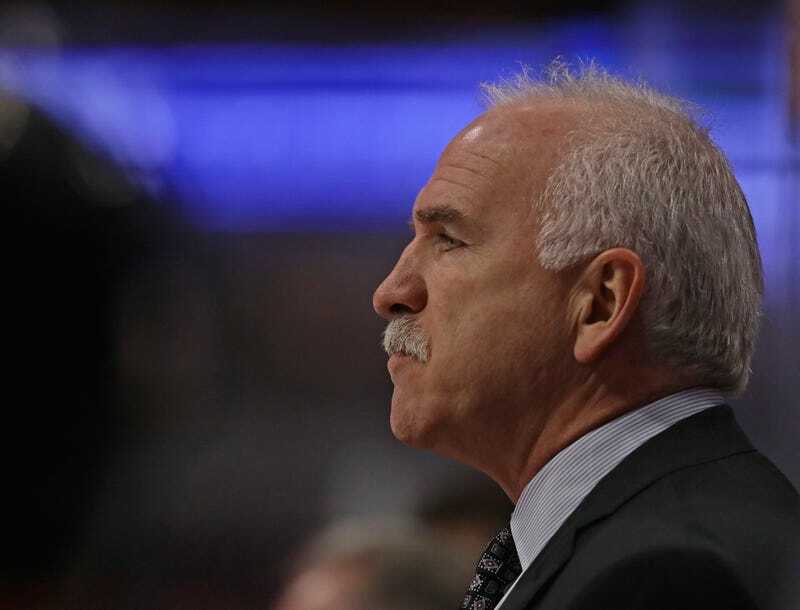 For the 60-year-old Quenneville—the second-winningest coach in NHL history—the new job offers a mix of intriguing potential and low-ish expectations. The Panthers are about as low-pressure a job as you can find in the NHL, given their lack of success over the past two decades, but some of the pieces are already there that could be immediately molded into a fun, Hurricanes-esque postseason squad if they could just get some stability in net. The swiftness with which the Panthers acted, and the price tag they paid for Quenneville, show that they’re not just content to mess around on the fringes, and maybe the big hire will pair with a splashy offseason to really trampoline the team into relevancy. But if it doesn’t work out, at least Quenneville’ll get a nice tan while trying.